Why Does the Space Used by Files on My Hard Drive Show Different Numbers Depending on How I Look? - Ask Leo! Depending on how you look at your disk, the amount of space used can appear quite different. We'll look at some of the possible reasons. It’s worse than you think. Just with a little poking around I was able to generate several different numbers for the “spaced used” on my hard drive. I’ll admit, it’s frustrating. Fortunately it’s not something we need look at very often, but you’d think the line between what’s used and what’s not used would be clear. Actually it is, but there are different ways of looking at “what’s used” that don’t tell the whole story. As you can see, Explorer reports that about 47.8 gigabytes are in use, and that 24.6 gigabytes is available as free space. 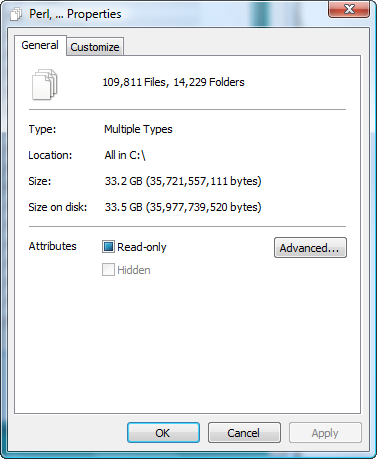 If you’re just wondering about the free space on the drive, or how much of the drive is in use, these are actually the numbers I’d use – they take pretty much everything into account. You can see that Windows reports the size of all files in C:. It reports both size, and something called “size on disk”. And neither are the close to the 47.8 gig reported to be in use earlier. Let’s clear up “size on disk” first. Windows allocates space for files in “clusters” or “allocation units”. The size of a cluster varies, but ranges from 512 bytes to 32K or more. On my C: drive the allocation unit is 4096 bytes. What this means is that Windows will allocate 4096 bytes for any file or portion of a file that is from 1 to 4096 bytes in length. A 1 byte file? That takes up 4096 bytes “on disk”. 100 byte file? Still takes up 4096 bytes on disk. A 4097 byte file? That takes up 8192 bytes – one complete 4096 byte cluster, plus another 4096 byte cluster to hold the extra byte. So in determining how much disk space is used by the files, we need to pay attention to the larger “Size on disk” number. But that number is still very different than the 47.8 gig. Hidden and System Files – The Windows Explorer display above was using the default settings which do not display files marked as “hidden” or “system”, and as a result they are not included in the calculation. Changing that setting increases the “Size on disk” by approximately 7 gigabytes as all the hidden files on my machine were included in the calculation. Most notably that included the system swap file and hibernation file, both of which are large, and marked as hidden. Directories – directories, or the lists and indexes of the files on your machine, are not files themselves, but they do take up space. The File Allocation Table or Master File Table – The FAT itself, of FAT file system fame, is actually pretty small. The MFT however, used in NTFS file systems, is also stored on disk but not visible as a file. It defines where the used and free space on a disk actually is. Depending on the size of your disk, your files, and the size of the allocation unit, the MFT can be quite large. The Log File – it’s a file, but again, you won’t see it. This is internal NTFS data. There’s probably much more that I’m not aware of that enters into the picture as well. I know in researching this issue there was no way I could actually get all the numbers to add up. Possible additional culprits further confusing the situation include compressed files (which appear bigger than they really are on disk), junctions and shortcuts which may or may not be counted as files, utilities which may or may not include the recycle bin as part of the “spaced used” since the contents have technically been deleted, and Windows Vista’s ability to keep additional versions of files automatically (though where they’re kept and how they’re managed, I’m currently not sure). So yes, it is confusing. But as I said earlier, I would rely on the drive properties to tell you about the actual used/unused state of your drive. Why doesn’t my new, empty hard drive show all the advertised space? - As it turns out, common terms used to measure disk space can be ambiguous. As a result, a megabyte to you might not be the same as a megabyte to your computer. « Previous post: Why Is My Task Manager Disabled, and How Do I Fix It? I recently had a problem similar to the poster here. I have a 75 gig hard drive and only about 2 gigs that were available for me to use. I checked with Windows Explorer where all the space was being used, it sure wasn’t the Programs or Photos or Videos, all but Programs are Space hogs. I usually always store my videos and photos on another drive besides my System drive. So I look and look and finally I found where most of my available space was used, as weird as this is it was in the Windows temp files….a huge amount of space was being used by the temp files, like 26 gigs of space!! I wasn’t sure if I could just delete these files and why it was keeping so many temp files anyway. I called the Microsoft Tech dept. 800 number I have handy and just asked if I could delete these files, first they gave me the run around and that I might delete something important, so I asked for someone that knew more, they connected me to a tech guy and he told me to just delete the files it was nothing important and that it shouldn’t cause any problems. He did walk me thru it and at first we tried from the normal start up to delete the temp files and it kept bringing up files that it said it was using, hmmmm, anyway he had me boot into “Safe Mode” and from there I was able to delete the whole thing, he had me type in %temp% into “Run” and it deleted the files with no hang up’s or problems, it worked wonderful, no problems afterward and it created a huge amount of free space on my system drive. What a relief, but as far as a good reason why there were so darn many temp files I have no idea…all I know is that is stupid if you ask me and it should limit the temp files it keeps, and should in no way, shape, forum, or fashion keep that many temp files. I looked at the temp files before deleting them, it had photos, videos, system files of some kind and just about anything was in there. Their gone now, haha, anyway it helped me a bunch and it sounds like what the poster here might have, I found the temp files buried under “my documents”, and its not the temp files listed in the breakdown in Explorer towards the end under the system drive. Good Luck and I hope this helps someone else. I have this problem with both my C: and D: drives. The properties of my D: Drive shows “Used space: 214 GB”. The properties of all the files and folders show “Size: 133 GB”. The properties of my C: Drive shows “Used space: 135 GB”. The properties of all the files and folders show “Size: 90 GB”. Approximately 80 GB is used up somewhere on my D: drive. Does anybody know how to get it back on a Windows Vista PC? Thanks for this post. The comment from the user above led me to a solution for my situation. I was working on a Lenovo T60 with a 120GB hard drive. Only 16GB were showing free in the C: properties, yet selecting all files, including hidden and system on C:, showed only 46GB in use. There was a hidden Rescue and Recovery program built into the laptop. It had automatic backups that presented no notification. I turned off the scheduled backups and deleted the backup files. This resulted in the drive having 60GB free! Thanks! So frustrating. This comment is describing to a tee the situation I am facing but unfortunately the solutions others have found don’t seem to apply or resolve my 44G discrpency. I have no hidden backups, I’m showing hidden, system and OS files, I do not believe that I have RAID, and my %temp% folder has only 343MB in it. I am assuming that the Directories, MFT, and log file referenced above do not accound for 44G of space. Is there a way to see how much space is used for these three items? How can I confirm that there is no RAID setup on my machine? I have a much more confusing problem than that. Whenever I delete something on my computer, I LOOSE space, not gain it. I’ve done several virus scans and nothing has been picked up. For example, I had 194 GB of free space on Disk Drive C. I deleted a 2 GB file (using windows vista’s uninstaller) and I suddenly had 193 GB of free space left. I dont think this makes a huge difference but im running Vista Home Premium 64-bit. Try emptying your recycle bin. It’s possible that the uninstaller is “deleting” by moving the files there. To say it better,System Restore Points are calculated in size when you right click your drive and see the properties,but when you go into the drive and select all and right click and see properties they are not added to the total size you see there.My 60gb HDD had a 8gb difference, turning off System Restore fixed the discrepancy. But you also lose the benefits of system restore. Please help me my email is [personal email address removed]. I am using a Lenovo T60 laptop and it has 60gb hard disk in it. The avalable harddisk space 55gb. I used to delete the unanted temporary files, temporary internet files, cookies, prefetch, etc to maintain good performance of the PC. And there was 20gb free space which one day gradually decreased to 3gb,1gb,712mb,400mb,100mb and even worse to KB of 156kb and finally to 0bytes of free hard disk space and pops up disk cleanup utility to clean up hard disk. So i am unable to run any programs or work on it properly. Even if i free up unwanted files as well as wanted data and free up space in it, the free space decreases immediately to 66mb or lesser free space which makes the PC slow. I have not installed any unwanted programs other than the usual wanted softwares an i am pretty sure about that. I suspect if this is a virus or spyware issue. I’d start with this article: Where’s my disk space going? New article on that: How do I get System Restore to take up less space? in my computer the c drive size become less every day about 1 mb decrease in size of my 9.31gb hard disk, so what is the solution? in explorer go to tools, folder options, view. then, make sure to mark “display system folders”. you will see a “recycler” folder directly under C-drive. a lot of deleted items are stored there for some reason. so you have to extra delete your files. Microsoft vista has a automatic back up & restore. It creates a back up point every day or every time you install new software, drivers, or updates. This back up & restore feature is only allowed to use 15% of hard drive space & automatically deletes old back up restore points once it has used up the 15% of space. Now on a 1 terabit drive that’s huge. Your hard drive may only have 65 gigs used but with back & restore on it will show an additional 150 gigs used because back up & restore in on. To turn off, right click “computer” than left click “properties”. Now left click “system protection”, from that page you will see available hard drive(s) or partitions. Remove the check mark next to the hard drive(s) or partitions you don’t want automatic back up & restore on, then click apply. If you want it on, just put a check mark next to the hard drive & click apply. Now if you turn off this back up & restore it will immediately delete all back up points & you will see 15% of your hard drive now available again. A better way to run this back up & restore program is you can manually create them yourself when you want to not lose back up points. It’s a great program but it will eat up 15% of you hard drive space, but you will have back up points. One other way which I do is to have a back up hard drive that I manually back up all my info, and store in a safe place. With Vista Ultimate only(not home or other editions & sure about windows 7) you can back up entire system. There are other way also to save back ups, like run two hard drive in raid 0 or raid 1, either raid 0 or 1 I forget now will actually mirror everything from one hard drive to your other hard drive at all times. But will slow down you system, just like running the back up & restore program vista has. My system: 2 terabyte WD hard drive 64 mega of cache (with 3 partitions), ASUS P6T6 mother board, intel i7 core 965 (3.2ghz), Microsoft Vista Ultimate with service pack 2 update, 2 evga gtx 260 superclocked in SLI, toughpower 1000 watt power supply. IMPORTANT CLARIFICATION: “System Restore” is NOT NOT NOT a “backup and restore” in any general sense. Please read this article: Why can’t I rely on System Restore for backups? Is it normal for all of my drives other than my “C” drive to show completely full and no available space? And if not how can I clean them up? I have looked very deeply into this, and the biggest reason is System Restore. 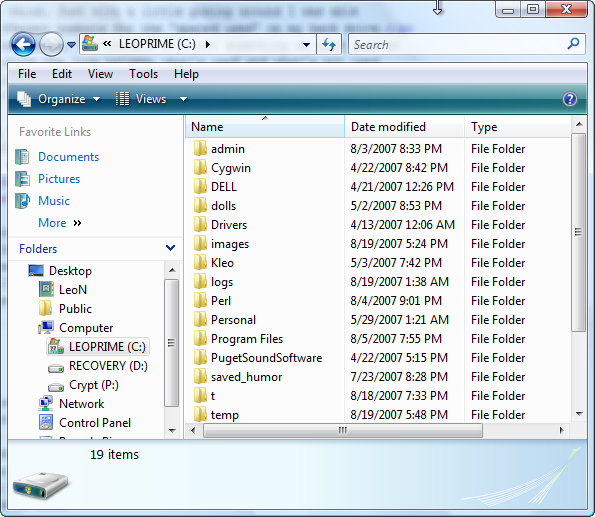 It uses disk shadowing and stores the data in the System Volume Information folder, which is hidden and a system folder. However, that folder will show up as 0kb in size, unless you change the security permissions as an administrator, and then go into the folder. My System Volume Information folder was 139GB!! where C is the drive on which you want to limit shadowstorage, and 30GB is the amount you want to limit it too. your drive letter and max size may vary. Absolute magic, O Supreme Universal Computer Genius! The acceptable syntax was somewhat different on my Windows 7, but the solution took effect instantly and the problem is solved – and I don’t need to buy a new, bigger hard drive! Thanks to Bruce, and to Leo. Mathew what was the syntax you used for windows 7 please?? I went from 240gb to 274gb,,,I have a usb external drive where I backup my system entirely. Backing up does not remove, move or delete any data, it only makes a backup copy of the data. You’ll still need to figure out what’s taking up space, and delete files appropriately. See Where’s my disk space going? I have two external hard drives [Toshiba and Lacie] for backup purposes so I can have one on and off site at all times in rotation. I’ve just copied contents between them and individually all files are equal size, but in windows explorer the drives’ ‘used spaces’ differ by a margin of about 1percent. A mystery as I have emptied recycle bins for each. Maybe each drive has differing system files. There is opportunity to ‘clean up system files’ but I do not dare to do that without knowing more. I am not bothered except that it would be useful if the sizes tallied because then individual files and folders would not need to be checked which can be too time consuming. Quite a helpful piece of information. But still I want to ask – should I be worried about such a situation? It’s nothing to be worried about. I have a 1.5TB HDD. Total used space of every files and folders on the drive is 1.1TB. When do a properties check, it showed used 1.4TB. That’s 300GB lost, and I’m crazy to look for it even in windows or linux and no luck has come to me yet. This article is good but still not good enough. You have to quantity each problem. 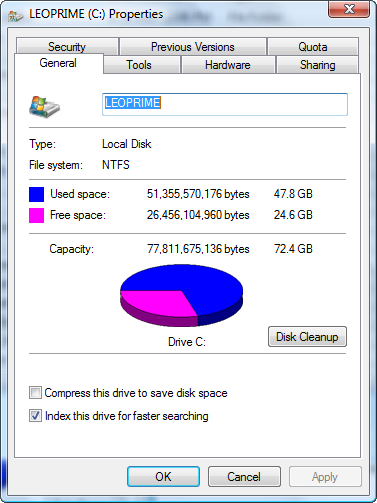 For example, with a NTFS files system for a 1TB HDD, how much space would it take? etc..
Clearing System Restore: Use “Disk Cleanup > More Options > System Restore > Clean up” on XP [ and prolly similar too on Vista/7/8 ] on a regular basis. SR creates it own restore points and these tend to accumulate over time. I also run CCleaner [ which can also be customized for specific files ] on a daily basis as an extra precaution. I’m impressed with your service! I’ve printed out the article and have read through it, but will read it again, more thoroughly, and will then comment. I’ll read the second article also and comment. i think that the discrepancy between the “used ” portion of the drive as shown in Properties and the actual amount of data on the drive is really huge. I have Windows 7 on a my HD and the amount of data stored is about 40-50 GB MAX . However when I want to do a Drive Image with the Paragon Software the size shows as 120 GB ! A lot of unnecessary memory used! I thoroughly cleaned the drive but I cannot find these extra 70-80 GB. Where are they? I think nowhere! The question is: how can I have the system read the drive size correctly, i.e. based on the actual data stored? I have two windows one is Windows 8.1 that is installed in C drive and other is windows 7 that is installed in E drive . So i want to know that how I can uninstall Windows 7 permanently . It is taking too much space and laptop is working very slow. All you’d really need to do is boot up in Windows 8.1, and then delete the files that are Windows 7 on your E: drive. Backup first, of course. I have a problem which my (data) D: drive that Curt raised many years ago but was never answered. The properties of my D: drive shows “Used space: 96.7 GB”. The properties of all the D: drive data files and folders show “Size: 34.7 GB”. So where are the other 62 GBs? I have tried the suggestions for freeing up space, but I just can’t reclaim the missing 62 GBs. Hello, figured out the cause of the discrepancy in the amount of used space by downloading and installing the freeware program TreeSize. The program revealed that the “Rescue and Recovery” function of my ThinkPad laptop was using 62 GB for backups of my data D: drive and storing this info in a hidden folder “RRBackup” on the D: drive. I deleted this folder and regained my 62 GB of space! (I moved the backup function to an external 2T USB hard disk drive.) Thank you for recommending this wonderful program. Regards, Allen. My problem on driver F: (not E: ) was resolved. It is a bit more complicated. It is due to backup file taking space. I can see in “backup and restore” that my backup file is configured to be on E: (not F: ), but there is a copy of backup files on F:\somefolder\myhostname . That is because last year, the backup location was configured to be on F: , then later I changed it to E: . The old backup file on F: is still there. Is there any progress to make both as successful? If you only have 100GB free and the program requires 200GB, it won’t work. The fact that it works in vRA is a surprise, but the most logical explanation is that is is actually using less than 100GB. In Windows Explorer, click on My Computer or This PC. Right click on the drive you want to check and select Properties (usually the bottom option) from the dropdown.